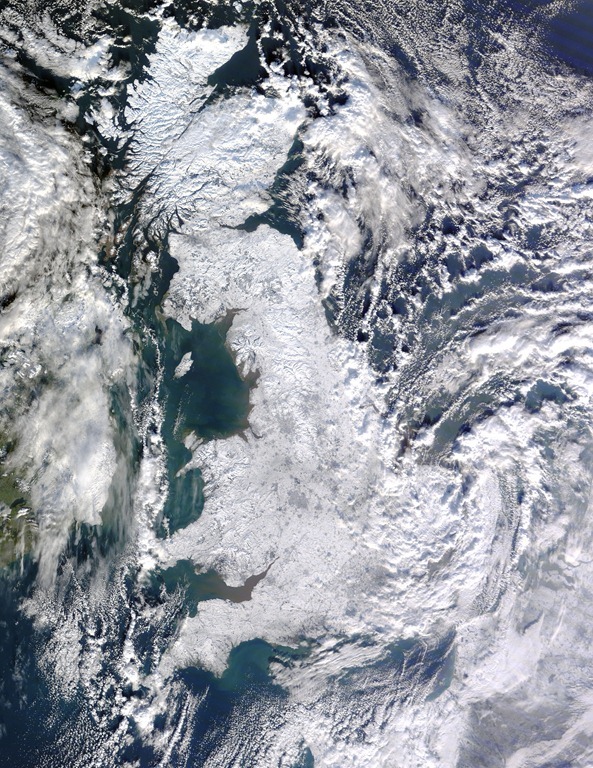 Thanks to @Jangles for pointing out this great pic of the recent snowfall in the UK from Nasa. Snow blanketed Great Britain on January 7, 2010, as the Moderate Resolution Imaging Spectroradiometer (MODIS) on NASA’s Terra satellite passed overhead and captured this image. Snow covers most of England, from the east to the west coast. The cities of Manchester, Birmingham, and London form ghostly gray shapes against the white land surface. Immediately east of London, clouds swirl over the island, casting blue-gray shadows toward the north.